Reykjadalur valley is close to the town of Hveragerði in South Iceland. 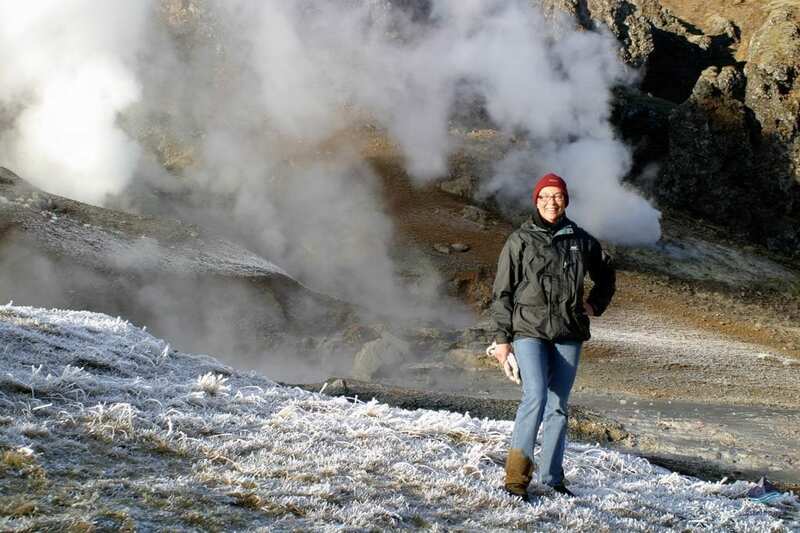 Reykjadalur Iceland is in one of Iceland’s largest active geothermal areas, Hengill volcano is situated a little to the north. 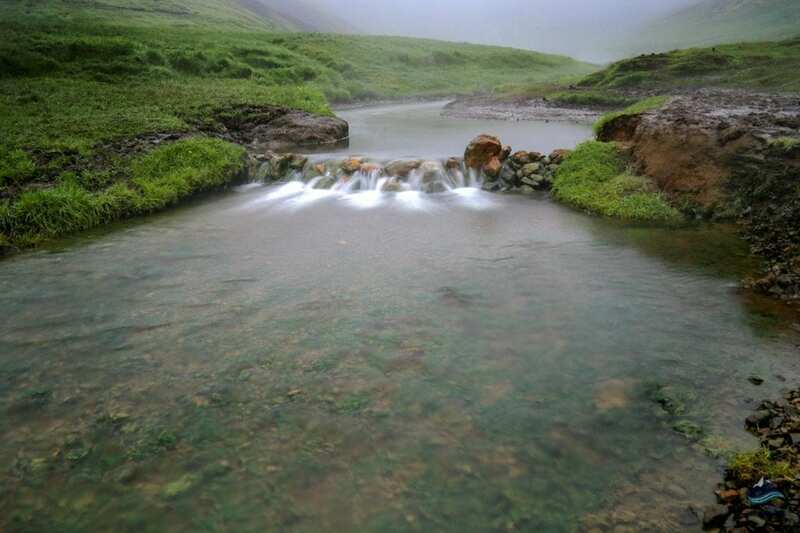 This is simply a magnificent hiking and hot spring bathing country! How to get to Reykjadalur? 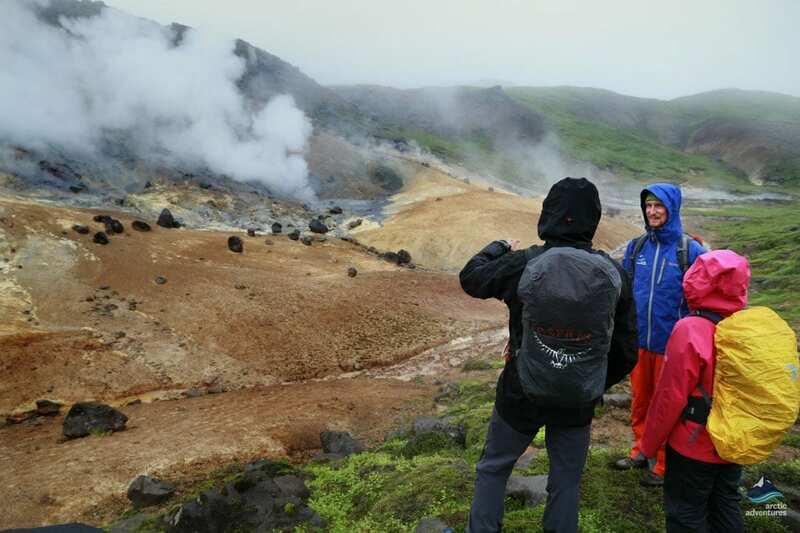 What to expect when you are at Reykjadalur? 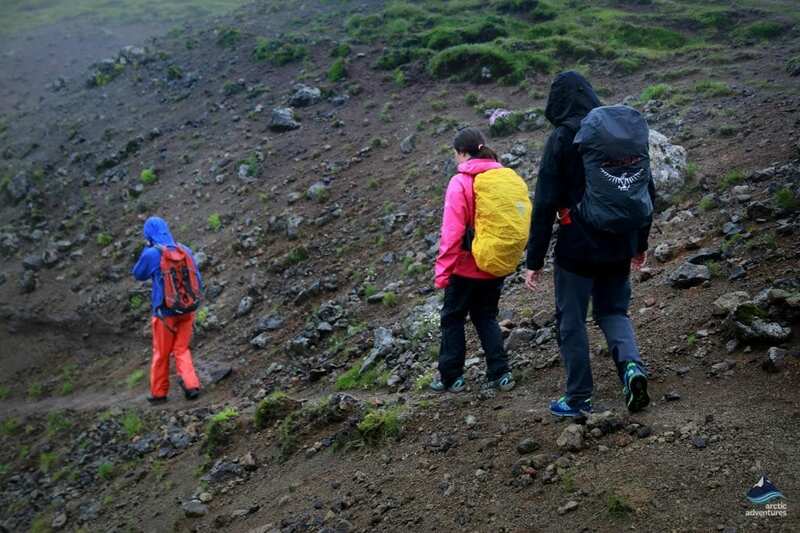 A hiking trail found not far from Hveragerði will take you 3.5 km through majestic mountain scenery and hot spring areas to the hot river at Reykjadalur. Bathing in the hot river will surely relax and rejuvenate those tired muscles. Rest back in the shallow water and take your time to absorb the spectacular natural vistas which surround you – allow Icelandic nature to work its magic upon you! 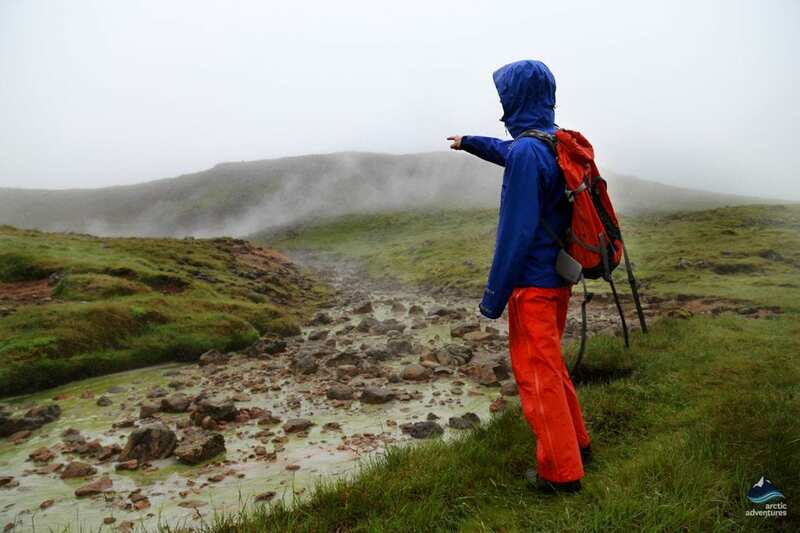 Our Hot Spring Hunt Tour includes a 45-minute mountain hike up to the Reykjadalur Valley. In the place where the hot spring blends with the cold spring you will have the perfect opportunity to bathe in the river. Basking in warm water in a natural river, surrounded by a magnificent landscape is very special. Finally, with memories and photos to treasure, you make your way back to Hveragerði. Reykjadalur is an interesting and quite descriptive name which is a blend of two words: “reykja”, which means smoke, and “dalur”, meaning valley. With the plumes of steam rising from the earth being visible over long distances it is no wonder that this valley is so named! 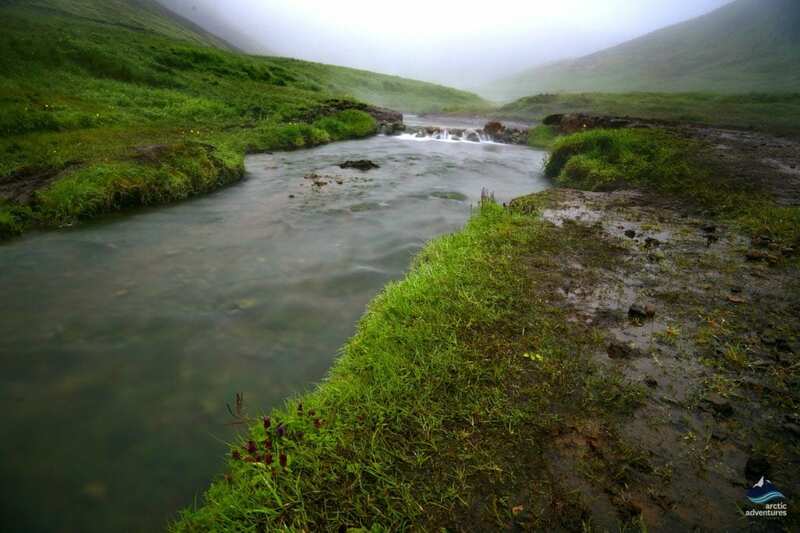 Nearby Hveragerði is sometimes said to be the hot spring capital of the world. Reykjadalur can be found in the south of Iceland and close to a little town called Hveragerði which is 39.4 km from Reykjavík. Having Hveragerði close by can be very handy as there are all types of services including a supermarket, restaurant and a gas station. You can also find an information center here if you are in need of any help. Some of the geothermal water is used in the cafes and restaurants here by using the water to help with cooking. 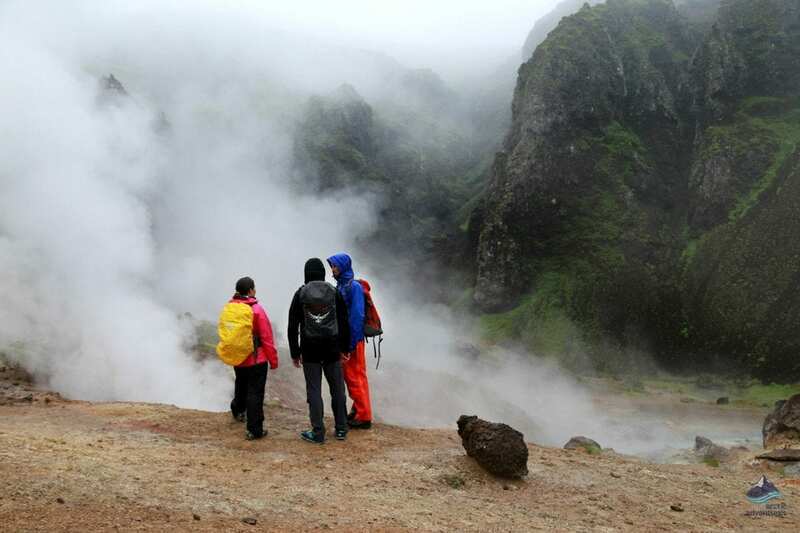 This is truly an all-around natural geothermal experience. 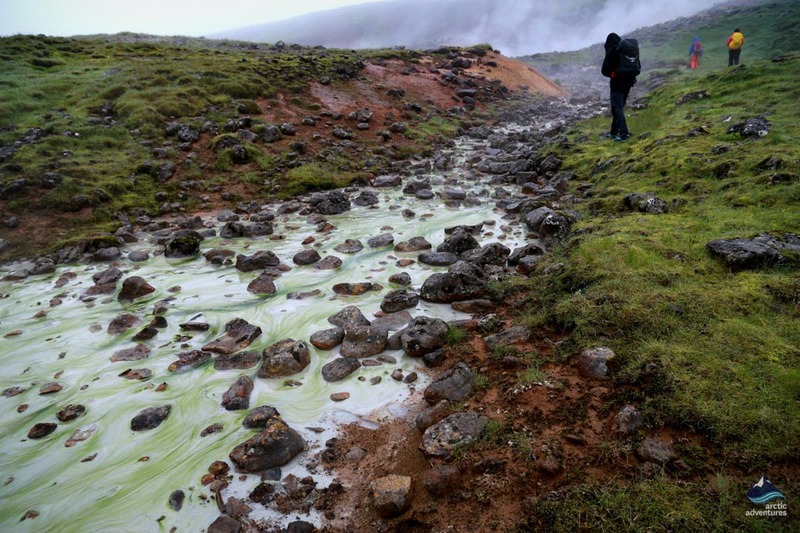 If you are traveling from Reykjavik, it doesn’t take too long to get to Reykjadalur at all. 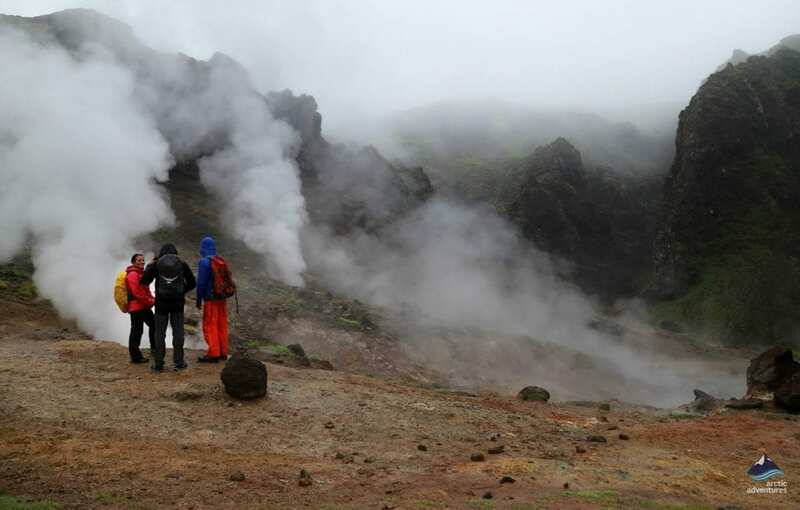 Being a shorter hike and so close to Reykjavik, this is a great day trip. The hiking route can be found by driving through Hveragerði on the Ring Road heading in the south direction, this is about an hour away from Reykjavik. After this, a gravel road will allow you to reach the parking lot, this is where your adventure begins. 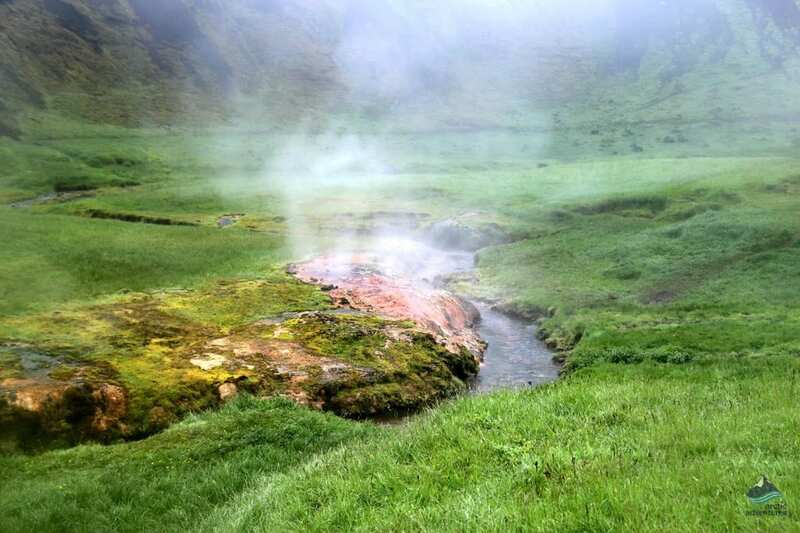 Known as ‘Smokey Valley’ expect your gaze to be met by vents with steam rising and bubbling springs. The path winds around the hills that lead you to a stretch of river that is paved with a newly built wooden path. 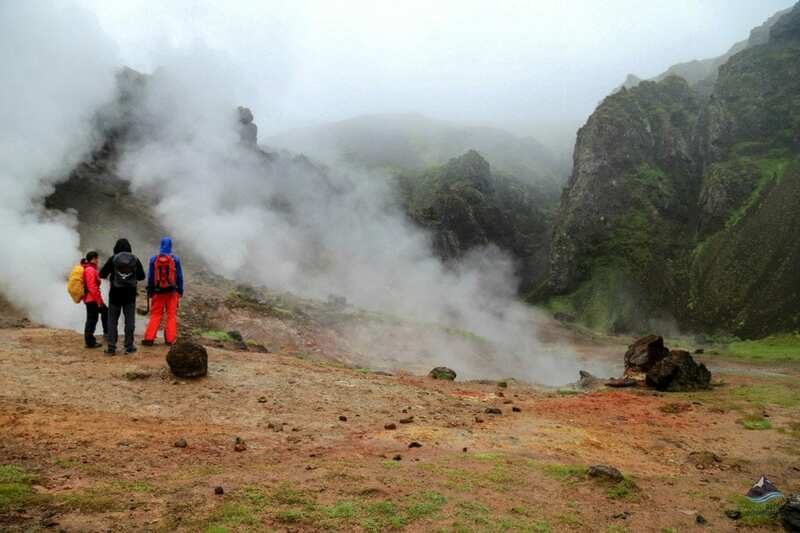 Here you can change and find the perfect spot to chill out and bathe in the geothermal areas. All in all the hike takes just over an hour depending on the speed that you are comfortable with. In the summer months of the year, the plants and flowers are in abundance and totally changes the scenery between winter and summer. The chemicals that rise from the springs explode in color over these months and paint the soil in greens, reds, yellows, and blues. Once you have started the hike you will come across a borehole named Drottningarhola. Keep an eye out for this as it is a great photo opportunity. Reykjadalur hike just keeps on giving, before you emerge by the hot river, a beautiful waterfall flows over the valley. 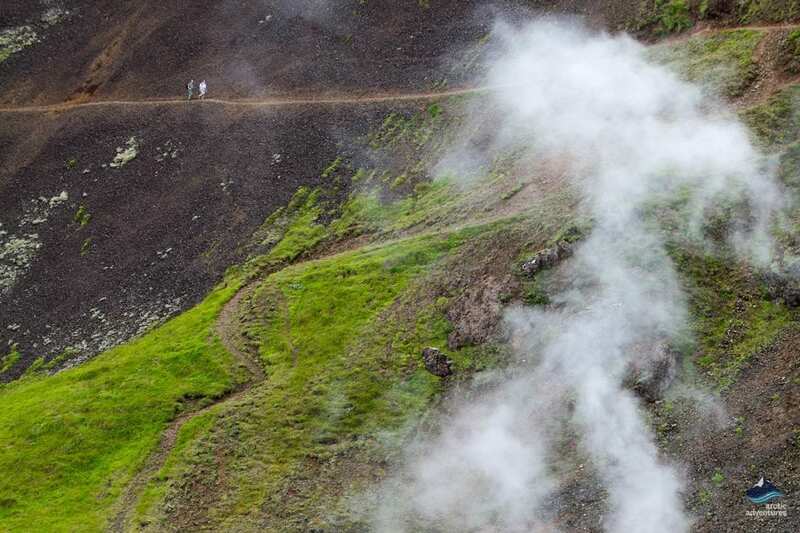 Make sure to stay on the paths when necessary as there is a large amount of boiling hot pools that can be dangerous. The further you go up the hot river the hotter the water gets, so be sure to keep this in mind when choosing a spot. Stick to the paths – this is done with your safety in consideration. As previously mentioned there are a number of really hot water pools. It can be extremely dangerous if you are to mistake them for safe places to bathe. These paths were not only built with you in mind but also to protect the nature that surrounds the area. Pack clothes accordingly – make sure to pack every type of clothing that you may need as the weather can drastically change very quickly. Also, double check that you have packed your bathing suit as it will be a real shame to complete the hike and not be able to spend time winding down in the river. Rent a car if you are not joining a tour – public transport outside of Reykjavik can become very tricky and can make your trip a lot longer than it needs to be. Rental cars are easy to come across and can save you a lot of time. Bring hiking boots – you’re completing a hike, of course, you need to bring Hiking boots. Your feet will thank you later. The main thing that you need to be prepared for in the Winter is the weather. 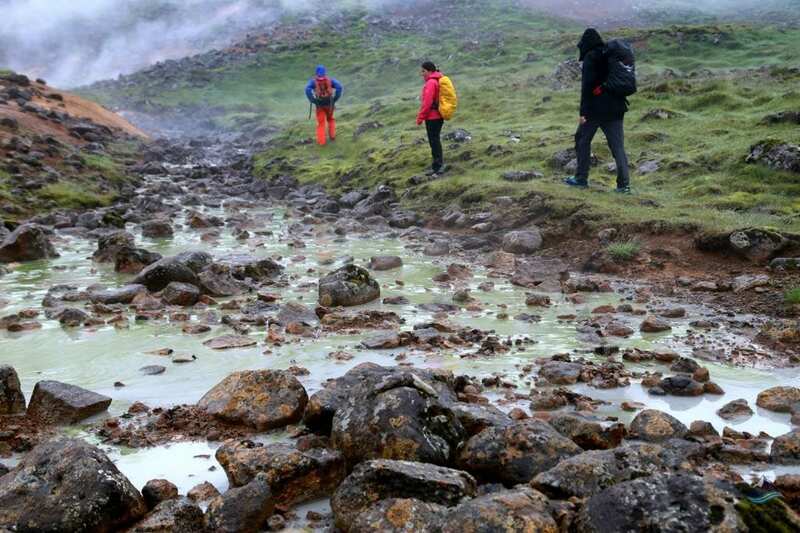 It is so unpredictable and can become dangerous quickly if you are not experienced hiking in conditions such as heavy rain and snow showers. The other problem that you might face is icy paths and this will limit how high you can climb and if you can get back down safely. 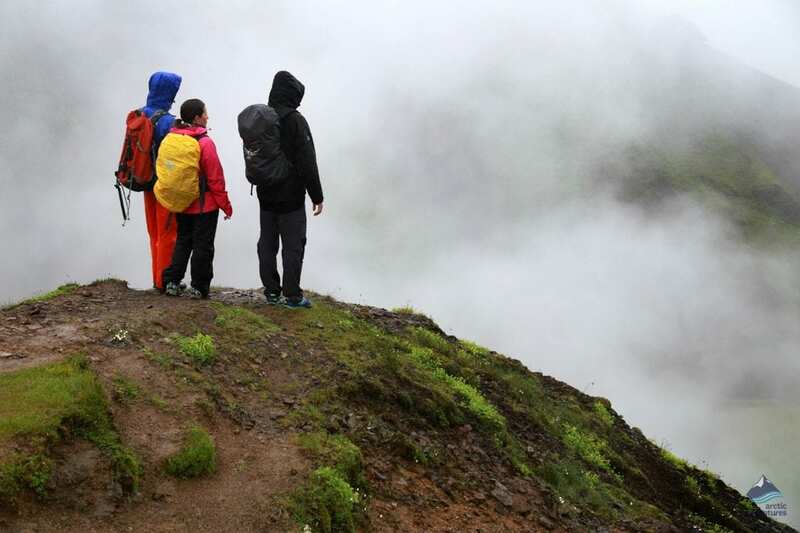 Make sure you are fully aware of the weather conditions and how they may affect your hike. If you are in luck then you may well be in for a chance to seeing the Northern Lights. It has to be very clear weather and a high amount of solar activity to be able to see them. It also has to be very dark so it may not be the safest of places to try and see them on this hike.